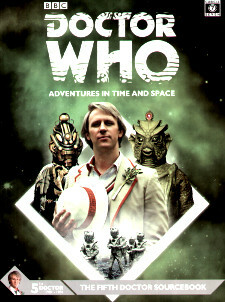 Celebrating the 50th anniversary of Doctor Who, this SOurcebook explores the Fifth Doctor's adventures on Earth and beyond. With detailed information on all the allies, enemies, aliens and gadgets that he encounters as well as examining each of his adventures, the book contains a wealth of material for the Doctor Who: Adventures in Time and Space RPG and is also a fact-packed resource for fans of the show! Betrayed by the Master and left to die on Earth, the Doctor faced his most difficult regeneration yet - but it'd be nothing compared to the heartbreak, betrayal and loss that was to come. Fly Concorde through time, re-enact the English Civil War, play in a ripping game of cricket and race yachts around the Solar System for the greatest prize of all. Witness the return of some of the universe's greatest foes, restored and deadlier than ever, and thwart their machinations once more...but at a cost.